In her following guest posts, she will share a bit about working with wild penguins. My name is Jessica and I am a penguin biologist. I live in the pretty little harbor town of Lüderitz on the southern coast of Namibia. Most of my fieldwork takes place on Halifax Island, home nearly 6,000 African penguins and about 10 km west of town as the crow flies. For the last eight years my colleague Dr. Katrin Ludynia, aka Katta, from the University of Cape Town in South Africa has teamed up with me for a project that involves deploying GPS data loggers on unsuspecting breeding African penguins. These loggers regularly record over time the position of a penguin as well as other information such as time, dive depth and water temperature. This in turn provides important insights on penguin foraging areas, habitats, ranges and behavior which are vital for guiding conservation management of this endangered species. bearing one of our GPS loggers arrives back in its nest. The general idea is to equip a penguin with such a device for about two days to obtain precise details of one foraging trip. The device is small enough not to be a burden to the penguin, but it also means that it is limited in terms of how much data can be stored; its battery life span is about three days. The device has to be retrieved in order to download the data and great care is therefore needed to choose a penguin that is likely to return to the colony after a foraging trip. Katta and I have done this many, many times and by now are pretty good at choosing the right penguin to carry our precious piece of equipment. How to select the perfect candidate…the trick is to find an accessible (but not isolated) nest with a relaxed-looking penguin caring for one or two well-fed, medium- to large-sized downy chicks. 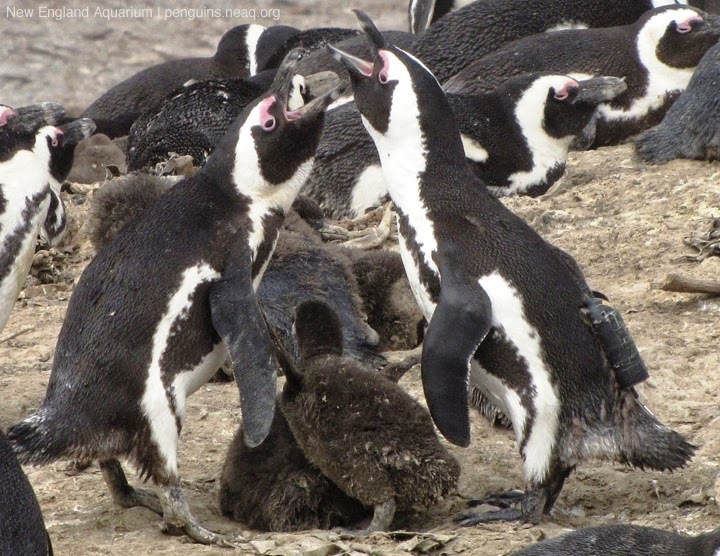 At this stage of chick development, African penguins are strongly bonded with their offspring and the chicks are still small enough to be looked after by one parent (while the other one is away foraging, usually for about a day). Choosing smaller chicks is unwise, as the disturbance created by catching the parent may cause nest abandonment at that stage. Small chicks are also at greater risk of being viciously attacked by upset penguins nesting next door or by marauding kelp gulls while the parent is being equipped. Choosing chicks close to fledging age may also be problematic; at that stage parental commitment may be abating as the chicks are subtly encouraged to start fending for themselves. Keep reading with Part 2 of this series. Everything starts out according to plan, but the researchers quickly realize they are working with an unusual penguin!